The story of London’s Clerkenwell and Smithfield neighbourhood, from prehistory through to the present day, is explored in this book. 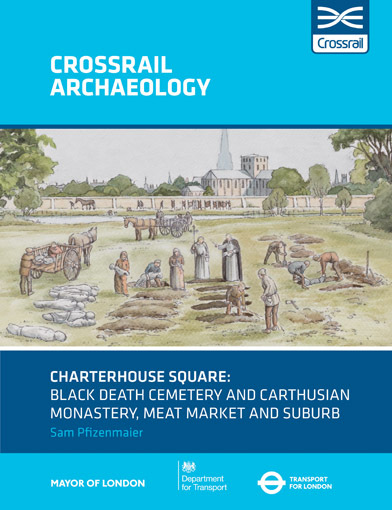 Archaeological investigations on behalf of Crossrail Ltd showed how this marginal area was occupied in the medieval period by religious houses and a cattle market, and then as London expanded from the 17th century became a densely packed suburb. The victims of multiple plague outbreaks, from the Black Death into the 15th century, were identified in the emergency burial ground established in 1348−9. 17th-century rubbish in the fills of the Faggeswell brook evidences the continuing livestock market and nearby households, some wealthy.